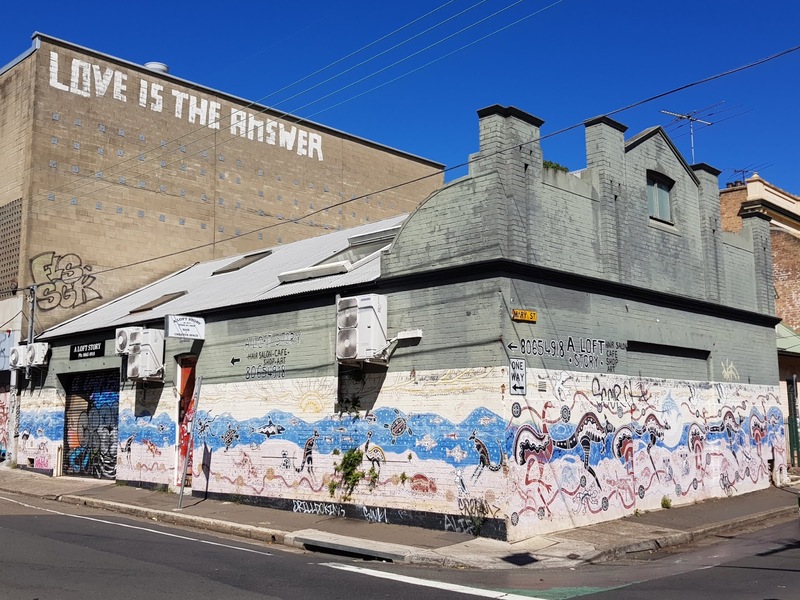 This mural featuring Aboriginal artwork is on a former warehouse located on the corner of Lennox Street and Mary Street, in the inner city suburb of Newtown. In 2014 it became a creative space called "A Loft Story" which features is home to a hair salon and a rotating roster of pop-up cafes, retail concepts, beauty services and art gallery. Nice one Jim. I like the "love is the answer" quote too. Thanks for participating. The aboriginal motifs are beautiful. Sad that ordinary graffiti have been added where they don't belong. Yes, it disappoints me to see graffiti spoil buildings, whatever type they are. It sure makes the building a lot nicer and the quote is beautiful. Even with the mural the building looks a bit forbidding to me. Any street art that uses blue lavishly is fine with me! I love murals that wrap a building like a gift.